Description Youth G15 Round 1 at 9:30AM: 4SS. $25 online. 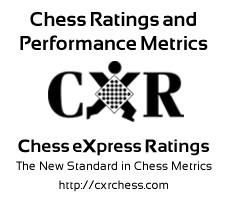 Chess Express Membership Required $7 Yearly. Free Entry for Master Warrior Kansas City Chess Club Members! Join the Kansas City Chess Club Online Here. ENT: Ken Fee, 1537 Baker St., Liberty, MO 64068. 816-399-3703. Awards: Chess Medals for ALL players. 1st Place Trophy for Best K-2/3rd-4th/5th-6th/and K-12 Players. Directions Park in the Back Parking Lot and enter the back door!